Rose allegedly flies into temper after being woken up too soon. GUNS N’ ROSES frontman Axl Rose caused mayhem at the festivals in Reading and Leeds last weekend, after he fired his entire stage crew and rehired them between performances. The band play Dublin’s O2 Arena tomorrow after last night’s concert in Belfast drew a largely unfavourable response from critics. 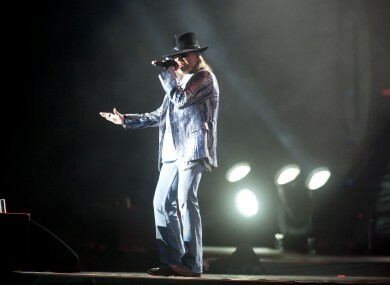 Earlier in their European tour, Rose caused controversy when a tweet posted on his account claimed that all upcoming Guns N’Roses concerts were cancelled. He later said that his account was hacked. Email “Axl Rose fires backstage crew, only to hire them again”. Feedback on “Axl Rose fires backstage crew, only to hire them again”.